And guess what... It's actually amazing! 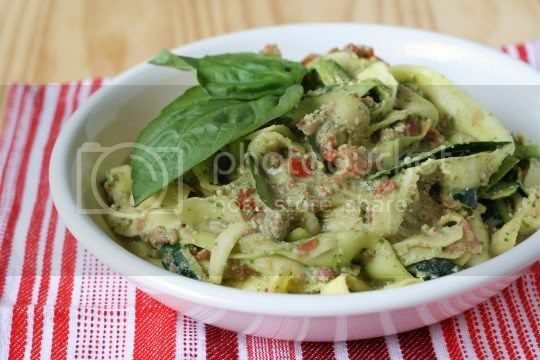 Who needs carbs and dairy when you can have this delicious rendition of a pesto pasta dish? The pesto on its own is SUPER flavorful, naturally vegan, and super easy to make. 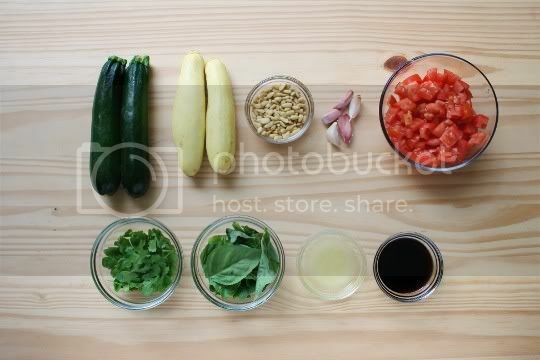 Simply puree pine nuts, garlic, fresh cilantro and basil, lemon juice, and Braggs Liquid Aminos in a food processor until smooth, then add chopped tomatoes and pulse until they're broken down into bite-sized pieces. Seriously, this might be some of the best pesto you've ever had. It's smell is absolutely intoxicating, and the flavor is super garlicky and pungent. One thing, you might find this a bit on the salty side, so just reduce the Braggs by a tablespoon, or add it to taste as you go along. Don't worry, the salt will mellow once the pesto is added to the squash pasta. This was my first time using Braggs, and I must say, where the hell have I been? The stuff is great, adding a salty, savory, meaty umami flavor...moreso than with any ingredient or condiment than I've ever tasted. It literally gives a meaty smell and taste to whatever it's used in, thereby rendering pesto's typical ingredient of Parmesan completely unnecessary. I can't wait to try it in more things, possibly even in place of soy sauce. To make the pasta, you could use one of those fancy vegetable spiralers...or you can use a plain old vegetable peeler. The strips will be straight and won't look much like pasta...that is, until you toss it with the pesto. Suddenly, it becomes more wilted and pasta-like, yet it stays crunchy (even leftovers!). 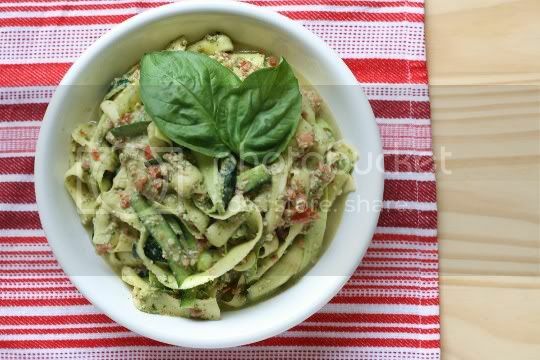 This dish is great for the summer, or anytime when you want to deviate from your usual pasta dish. It's light and refreshing, but it has such a hearty flavor that you definitely won't think you're just eating a bowl full of veggies. Make again? Yes. A must for anyone who likes pesto. Okay this looks amazing. I will have to try it soon! Thanks for the wonderful recipe as always!